Famous for its warm hospitality and incredible beauty, Canada’s east coast and Quebec is a must-see for its unique experiences. New partnerships with Maritime Bus, Maheux and Galland will give Busbud users the option to enjoy a revitalizing journey through Canada’s magical Maritime provinces and Quebec! 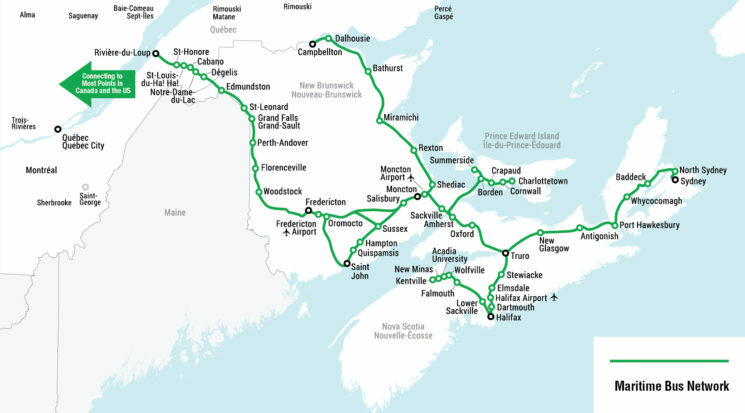 With 11,000 new routes, bus travelers get access to and from the Canadian East Coast as well as the Laurentians. Busbud now has routes covering small towns and larger cities in Nova Scotia, New Brunswick and Prince Edward Island and will now help people traveling to and from places like Sydney, Nova Scotia, Campbellton, New Brunswick and Charlottetown, Prince Edward Island. Busbud has now added coverage within the province of Quebec, most notably, routes to and from the Laurentians. With 13 ski centres within a 64km area, this makes a great location for adventurers! With this added inventory, Busbud is able to continue it’s mission of giving bus travelers as many options as possible. We now cover almost all of Quebec and a huge part of Eastern Canada inventory. Our coverage has grown so much that users can really be adventurous and use Busbud to go from Sydney, Nova Scotia all the way to Mexico city with only a few bus transfers. Crazy, huh? Find your bus tickets on our website or on our iOs and Android apps.